Adjust oven rack to middle position and heat oven to 300°F. Line a 9×13” pan with foil with extra hanging over the edges of pan. Push foil into corners and up sides of pan, smoothing foil flush to pan; spray with vegetable oil spray. Whisk maple syrup, sugar, and salt together in large bowl. Whisk in oil. Process ½ cup oats in food processor until finely ground, 30 to 40 seconds. Transfer to bowl with maple syrup mixture and stir in remaining 1 ½ cups oats, pecans, pepitas, sunflower seeds, and coconut until all dry ingredients are thoroughly coated. Transfer oat mixture to prepared pan and spread into thin, even layer. Generously spray large metal spatula with oil spray, then firmly compress oat mixture with spatula until very compact. 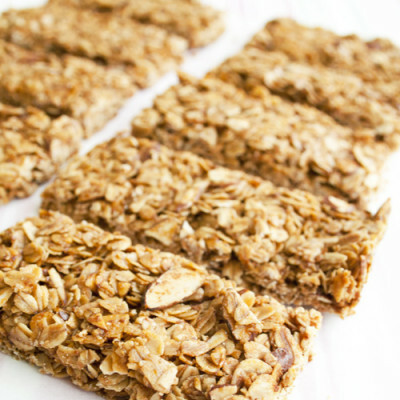 Bake granola bars until deeply golden, about 45 minutes, rotating pan halfway through baking. Let bars cool in pan on wire rack for 15 minutes, then cut, still in pan, into 16 bars. Let cool to room temperature, about 1 hour. Using foil overhang, lift bars out of pan and transfer to cutting board. Using sharp knife, carefully recut bars following original cuts. Granola bars can be stored at room temperature in airtight container for up to 1 week. Recipe courtesy America’s Test Kitchen. Image courtesy NancyCreative.com.